Garlock IFG Style 5500 Inorganic fibers with a nitrile binder. A compressed non-asbestos gasket sheet of inorganic fibers and high-temperature fillers with a nitrile (NBR) binder. 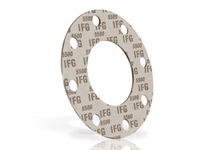 Designed for general-service applications up to 550° F (290° C) continuous. ABS Fire Safe Type Approved.